I had wanted to get Dr. Eric Westman on together with Dr. Adam Nally (Twitter: @docmuscles), since they are both members of the American Society of Bariatric Physicians (Dr. Westman is this year’s president), but Dr. Westman proved to be somewhat elusive, and I decided to go ahead with Dr. Nally by himself. 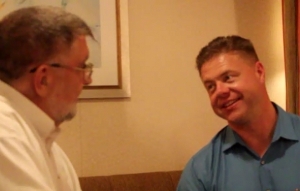 Dr. Nally graciously agreed to come up to our cabin just after the 2nd “formal” night dinner on the 2014 Low-Carb Cruise, and we had a really delightful chat. I kept the video to under a half-hour, but we continued to chat for quite a while after the end of the video. I hope to do a follow-up interview with Dr. Nally — maybe on next year’s cruise, or perhaps an online interview in a few months. 02:40 Why are we prescribing pills that don’t work? 15:30 The reasons Dr. Nally choose a career as a D.O. instead of an M.D. 19:10 Is Low-Carb the answer? Dr. Adam Nally is a member of the American Osteopathic Association (AOA), American College of Osteopathic Family Physicians (ACOFP), American Academy of Family Physicians (AAFP), American Society of Bariatric Physicians (ASBP) and the Arizona Osteopathic Association (AzOA). He served in the United States Air Force Reserve until 2005. He is originally from Orem, Utah, and has been a resident of Arizona since 1987.